Beat together eggs, flour, caster sugar,, butter, baking powder until smooth in large mixing bowl. Put cocoa in separate mixing bowl and add water a little at a time to make stiff paste. Add to cake mixture. Turn into prepared tins, level the top and bake in preheated oven for about 20-25 mins or until shrinking away from the sides of the tin and springy to touch. Leave to cool in the tin, then turn on to wire rack and cool down completely before icing. To make the icing: measure the cream and chocolate into a bowl and carefully melt over pan of hot water over a low heat. Stir until melted then set aside to cool a little and to thicken up. Spread apricot jam on to each cake. Spread half the ganache icing on the top of one of the cakes, then lay the other on top sandwiching them together. Use remaining ganache icing to ice the top of the cake in a swirl pattern. Line two 12 hole muffin tins with paper cases. Sift the cocoa powder into a bowl, pour in the boiling water, and mix into a thick paste. Add the remaining cake ingredients and mix with an electric hand whisk (or beat well with a wooden spoon). Divide the mixture equally between the 24 paper cases. Bake in a preheated oven at 200C (400F, Gas 6) for about 10 minutes until well risen and springy to the touch. Cool in cases on a wire rack. Make the icing. Melt the butter, then pour it into a bowl. Stir in the cocoa powder and stir to mix. Stir in the milk and then sift in the icing sugar a little at a time to make a glossy, spreadable icing. Spread the icing over the cakes and leave to set. 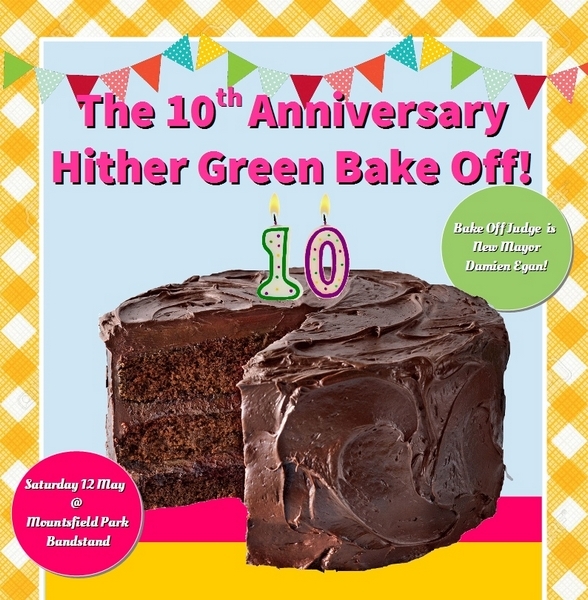 Next post Support the Hither Green raffle!